Yesterday’s men’s 15km freestyle interval start race featured one of the most split fields we’ve seen in that event in a long time. The top three, Northug, Olsson and Gjerdalen had modest gaps between them, but then there was just over 30 seconds back to 4th place. These are the gaps in median percent back between 3rd and 4th in every men’s 10/15km interval start WC, WSC, OWG or TdS race since 1992. 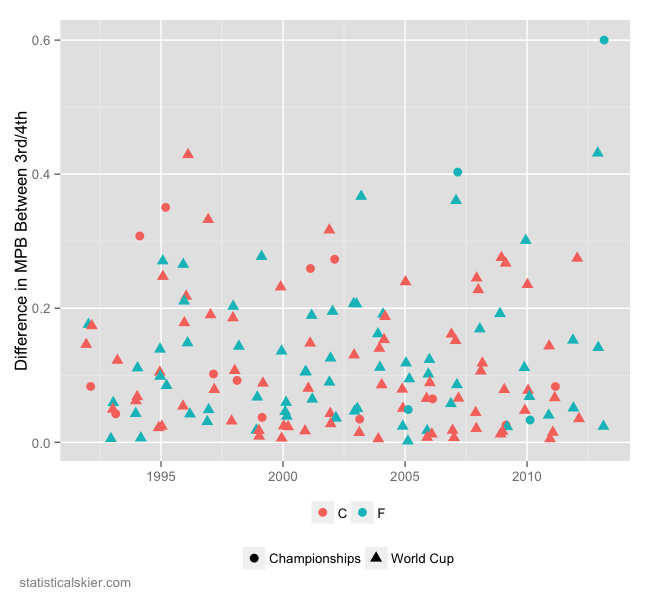 I’ve separated the classic/freestyle races, as well as the WSC/OWG (Championships) and regular World Cups. Yesterday’s race was a bit of an outlier, as you can see. However, it was only this past November that Johnsrud Sundby, Poltaranin and Hellner gapped the field in Sweden by around 20 seconds. Next is a classic 15km all the way back in 1996 (a regular World Cup). That was in February of 1996, in Russia, where Prokourorov, Smirnov and Daehlie (in that order) gapped the field by almost 31 seconds. That’s a larger raw interval, but as a classic race it was generally a lot slower, so the gap was smaller as a percentage of the total time. Posted by Joran on Thursday, February 28, 2013, at 6:00 am. Filed under Analysis, Cross Country, World Ski Championships. Tagged Analysis, freestyle, interval start, men, trivia, WSC. Follow any responses to this post with its comments RSS feed. You can post a comment or trackback from your blog.